What is minimally invasive lumbar spinal fusion? What are the advantages of minimally invasive lumbar spinal fusion? What is the disadvantage of minimally invasive lumbar spinal fusion? How effective is minimally invasive lumbar spinal fusion? Am I a candidate for minimally lumbar invasive spinal fusion? The majority of patients with low back problems improves within six to 12 weeks regardless of treatment and do not need surgery. Minimally invasive lumbar spinal fusion attempts to achieve similar results to traditional techniques with less blood loss, less pain, less muscle damage and shorter hospital stay. Minimally invasive lumbar spinal fusion through the abdomen has not been as effective and has increased risk of nerve damage compared to traditional fusion techniques. Minimally invasive lumbar spinal fusion through the back has been shown in short term followup studies to be as effective as traditional techniques with less blood loss, less pain and shorter hospital stays, but additional studies of its long term effectiveness are needed. The lumbar spine is the lower portion of the spine found at the center of the curve of the low back, below the rib cage. This area can be a common source of pain. Low back pain is the second most common reason for visits to the family physician, behind the common cold. As people become older, various changes occur in the lumbar spine that can cause pain. In most cases these changes are due to normal degenerative arthritis (wear of cartilage over time). The physician must also rule out other more serious conditions including tumor, infection, scoliosis (curvature of the spine), spondylolisthesis (slippage of one spinal bone on another), or fracture. Fortunately, most patients with low back pain will have improvement in their symptoms regardless of treatment within six weeks. During that time the physician has various treatment options including medications, physical therapy, or injections that can help ease the symptoms. Some of those patients that do not improve after six to 12 weeks may be candidates for surgery. The spine surgeon has different types of surgical options available based on the specific cause of pain. Lumbar spinal fusion is an operation that causes the vertebrae (bones of the spine) in the lower back to grow together. The goal of the lumbar fusion is to have the two vertebrae fuse (grow solidly together) so that there is no longer any motion between them. Removing the intervertebral disc (cushion between the bones) or bone spurs can reduce some of the pressure on the nerves, helping to reduce pain. Additionally, by fusing the two vertebrae together, this may stop the formation of bone spurs at that location, further reducing pain and potential nerve injury. There are many different specific techniques to try to fuse the vertebrae together. The surgery can be performed either through an incision in the back, the abdomen, or a combination of both. In many cases metal screws and rods are placed from the back into the bones to hold them in position while the fusion occurs. During an interbody fusion, the surgeon removes the intervertebral disc and places either a bone graft or a metal or plastic cage, or a combination of these in its place. The decision on what type of fusion is best for each patient is based on their specific complaints and the cause of symptoms. Spinal fusion can be very effective in the properly selected patient. Fusion with screws and rods can be performed through the back using several 1-2 inch incisions. In these cases a series of increasingly larger dilators (hollow tubes with solid inserts) are inserted through the incisions to help spread the muscles apart. Once the muscles have been moved away, the screws and rods can be placed through the dilator tubes. In some cases an operating microscope is used to help the surgeon see more clearly. One of the most recent advances in minimally invasive lumbar spinal fusion is the ability to perform fusion surgery through the patient's side. There are several techniques that allow the surgeon to make a small incision, approximately 2 inches in the patient's side, directly over the planned fusion site. The muscles are then carefully moved aside, and a series of increasing larger dilators are inserted down to the lumbar spine. Specialized instruments can then be used through the dilator tube to remove the intervertebral disc and place a bone graft or metal or plastic spacer in its place. This technique is typically combined with a procedure from the back to place rods and screws for additional support. The major advantage of all of these minimally invasive techniques is that there is less damage caused to the surrounding tissues. Unfortunately, in traditional spinal surgery it is necessary to cut through muscles and move them out of the way in order to reach the spine. This can cause a large amount of pain following surgery, and it can lengthen the recovery time. Instead of cutting and moving muscles, the minimally invasive techniques can more gently spread through the muscles to allow access to the spine. This is much less painful for the patient, and it does not require as long of a recovery period for the muscle to heal. Another benefit of less muscle damage is less blood loss and thus a reduced need for blood transfusions using the minimally invasive techniques. There is often less need for narcotic pain medications following this form of surgery, and a shorter hospital stay. As with any new technique, one of the major disadvantages is the additional time needed to perform the procedure. While a surgeon may be very comfortable with the traditional surgical fusion techniques, it will take time to be able to achieve the same outcome using these new methods. Surgeons with more experience can now perform lumbar spinal fusion in equal or even less time than with the traditional techniques. Not all surgeons perform these techniques, so it may not be available from your current surgeon or in your area. Because this is a relatively new technique, many insurance companies consider this to be an investigational surgery and do not provide insurance coverage for it, so a patient should check with the insurer prior to surgery regarding coverage. The results for the minimally invasive lumbar spinal fusion through the abdomen have not been as good as the traditional open anterior (from the front of the spine) fusion techniques. The success of the fusion has been less reliable, the operative times are longer and there are increased risks of injury to the nerves using the minimally invasive techniques. Because of this, many surgeons have stopped using this technique. The results of the minimally invasive procedures through the back have been much more promising. Experienced surgeons are able to perform lumbar spinal fusion through the back quicker, with similar fusion rates, less blood loss, and quicker recovery times than using traditional techniques. The newer minimally invasive lumbar spinal fusion techniques though the patient's side are still being refined. The initial techniques had some increased risk of damage to nerves, but more recent changes have made these even safer and more effective. The results so far are very promising for this technique, but there have been a limited number of studies. Additionally, since this was only recently developed, there are fewer surgeons performing this technique. First, you and your doctor need to determine if you are a candidate for spinal fusion. Remember, the majority of patients with low back pain recover within six weeks regardless of treatment. If you have had prolonged symptoms you should see your physician. If it is decided you may need surgery you will be referred to a spinal surgeon for further evaluation. If a fusion is thought to be potentially beneficial for you, the option of minimally invasive techniques can then be discussed with your surgeon. Chou, Roger, M.D> "Subacute and chronic low back pain: Surgical treatment." UptoDate.com. Mar. 11, 2016. What happened during your spinal fusion surgery? Bone spurs are pointy outgrowths of bone that develop in areas of inflammation or injury. They commonly occur on the heel and spine and may be the result of reactive arthritis, ankylosing spondylitis, or diffuse idiopathic skeletal hyperostosis. Symptoms include pain, numbness, and tenderness. Treatment focuses on decreasing inflammation and avoiding re-injury. Degenerative disc disease makes the disc more susceptible to herniation (rupture) which can lead to localized or radiating pain. The pain from degenerative disc or joint disease of the spine is usually treated conservatively with intermittent heat, rest, rehabilitative exercises and medications to relieve pain, muscle spasm and inflammation. Fractures of the spine (vertebra) can cause severe "band-like" pain that radiates around from the back to the side of the body. See a picture of Fractured Spine and learn more about the health topic. Spinal stenosis causes back pain, leg pain, difficulty walking and clumsiness. 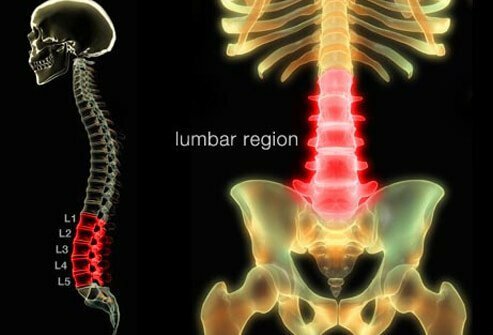 Learn the symptoms of lumbar spinal stenosis and cervical spinal stenosis and what surgeries are used for spinal stenosis treatment. Discover tips for relieving spinal stenosis pain without surgery, as well as useful medications.